OXFORD, Miss. 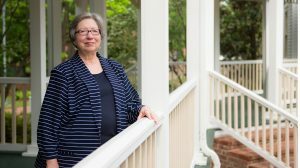 – Veteran University of Mississippi librarian Laura Harper may have left campus, but her legacy remains in the form of a treasure trove of information older than the Titanic and far below the surface of Google. Harper recently retired after 45 years at the J.D. Williams Library, but she continues to have such a strong desire for students to be able to access government information that she personally paid for subscriptions to databases that contain such documents as the unpublished transcripts of congressional hearings dating back to 1824, congressional research from 1830 forward and interactive, digital maps of Mississippi as early as 1867 through 1970. The recent database subscriptions plus her previous financial support for the library’s Information Commons, Art Store, STUDIOone and Friends of the Library bring Harper’s total giving to Ole Miss to more than $150,000. Harper takes her gift in stride. “I thought, ‘Why not? '” she said – modest words for this “extraordinary librarian” known for her “helpfulness and her ability to find anything you’re looking for,” according to letters from colleagues who recommended Harper for the prestigious 2011 Bernadine Abbott Hoduski Founders Award, which she won. Those comments are all true, said Cecilia Botero, library dean. “From my perspective, Laura’s gift to the university is the manifestation of her deep devotion to promoting access to government information and her desire to ensure that the UM community and the people of the state of Mississippi are offered the best opportunity to make use of that wealth of information,” Botero said. So what’s available? Oliver North, Iran-Contra, the different impeachment investigations, Watergate, Supreme Court nomination hearings, and the Lincoln, Kennedy and McKinley assassinations, just for starters. “Even the documentary, day-by-day, most detailed history and correspondence of the Civil War is there in full text,” Harper said. “All of the words in the reports are searchable – people, places, battles. Students researching these and other topics may be tempted to turn first to Google, but they’ll be hard pressed to find the most in-depth information, Harper said. “Government documents are by their nature a sort of difficult area, requiring a little more effort to try to research them,” she said. “You need to invest some time and get people to help you. Harper witnessed thousands of students succeed in her tenure at Ole Miss, which included 17 years in the Reference Department, 11 library directors/deans and six chancellors. “When a faculty member chooses to make a financial gift to the university, it speaks volumes about their commitment to the meaningful work that we do and the endearing qualities of this institution,” said Noel Wilkin, interim provost and executive vice chancellor. “For more than four decades, Laura Harper was committed to helping our students broaden their educational opportunities. After earning her undergraduate and master’s degrees from Louisiana State University, Harper’s first professional job as a librarian was in the public library in her hometown of Monroe, Louisiana. Then, she and her late husband moved to Oxford. As the regional depository for Mississippi, Government Documents provides guidance to smaller depositories and serves the entire state. The library’s catalog provides access to almost a million volumes of government publications, 40 percent of which are available in full text online. Before retiring, Harper moved to Technical Services, where she managed processing and cataloging of documents, as well as answered reference referrals. The Laura G. Harper Government Publications Fund is open to receive gifts from individuals and organizations; mail a check with the name of the fund noted in the memo line to the University of Mississippi Foundation, 406 University Ave., Oxford, MS 38655 or visit online at http://www.umfoundation.com/makeagift. For more information, contact Angela Barlow Brown, development officer for the J.D. Williams Library, at ambarlow@olemiss.edu or 662-915-3181.